Garlic flatbread recipe No Yeast. This easy garlic herb flatbread has no yeast, doesn’t need hours to rest, and has a secret ingredient- Aquafaba. 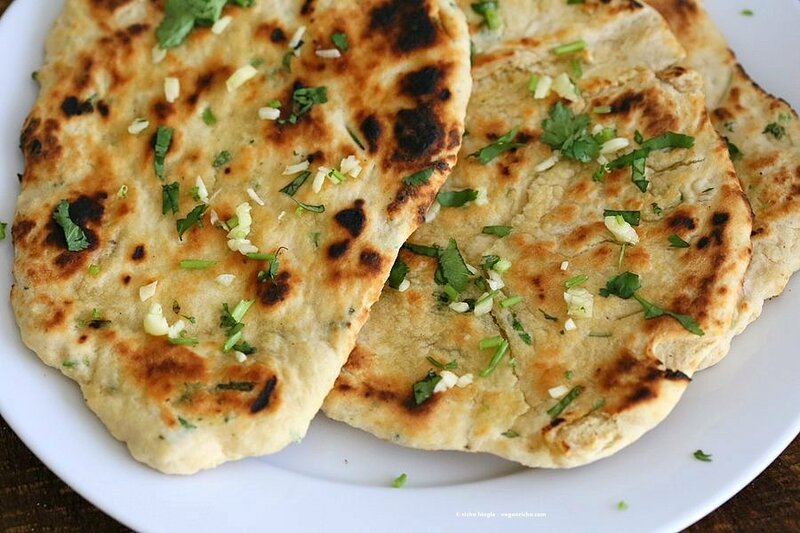 Vegan Yeast-free Garlic Naan Recipe. No yogurt, no Tofu. Easily doubled. Soft garlicky herb flatbreads make a great side with any meal, with soups, salads, dips, curries and more. This easy Garlic herb Flatbread has no yeast, doesn’t need hours to rest, and has a secret ingredient. Instead of non dairy yogurt, this flatbread uses aquafaba! Aquafaba is the liquid from a can of chickpeas or the viscous liquid remaining when you cook chickpeas at home. This viscous liquid has many uses like making eggless meringue, macarons, and used in many places instead of eggs/egg whites, as a binder for baking and more. Find out more about chickpea brine and all the amazing creations on Vegan Meringue Hits and Misses Facebook Group. For this flatbread, aquafaba adds moisture, binding and the fluffyness. 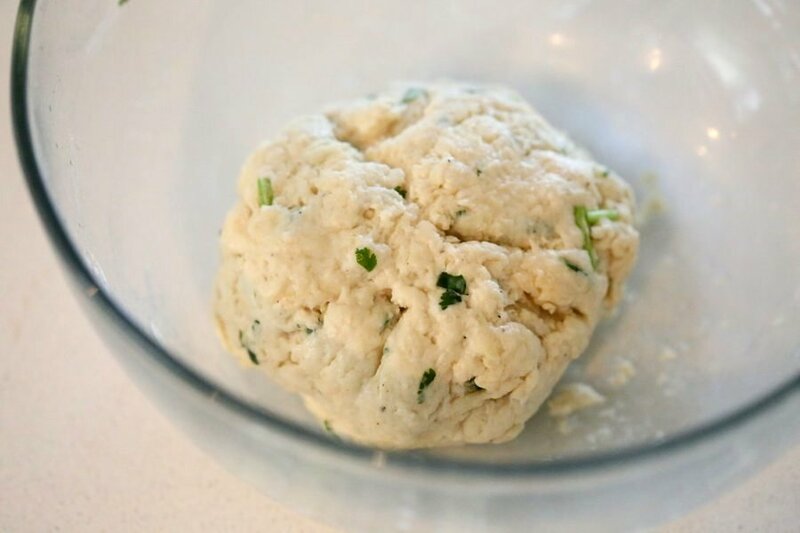 Make the dough for the flatbread, roll it out, grill or cook then brush with the herbed garlic butter mixture, done! 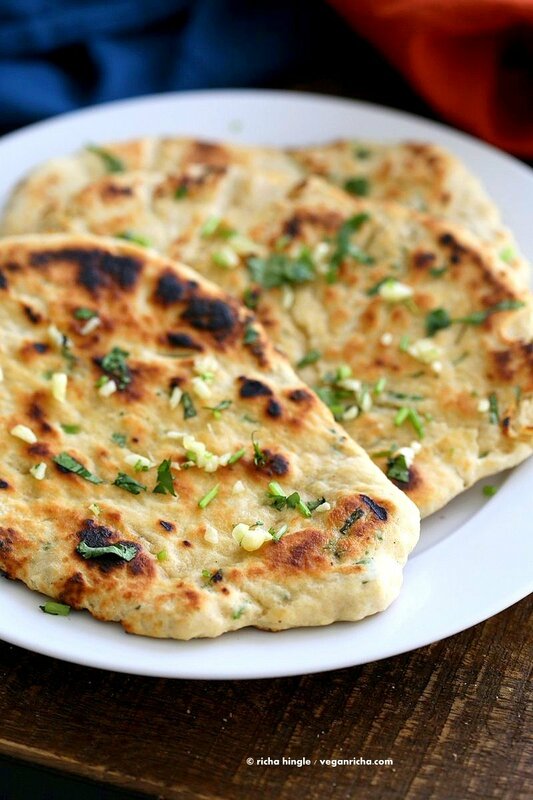 You can also make these flatbreads into Garlic Naan. 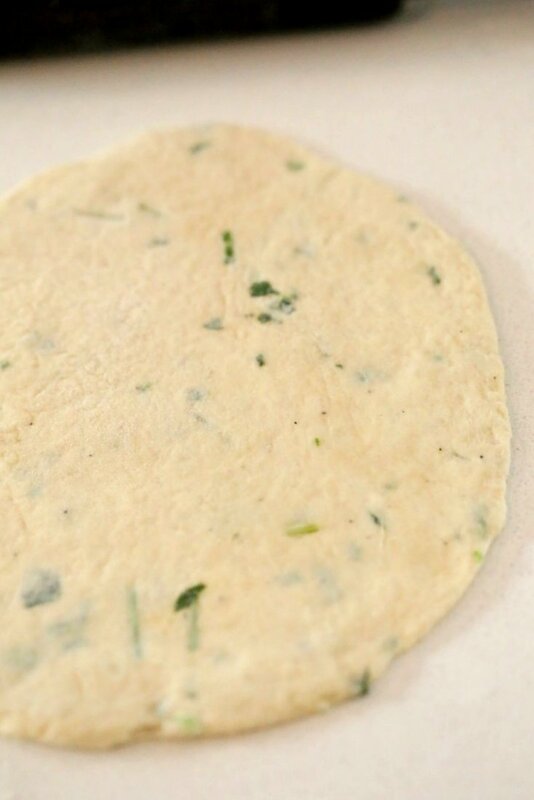 Press the garlic and cilantro into the rolled out flatbread along with nigella seeds, and then cook. Easy and ready within minutes. No yeast, no waiting for a hour for the dough to sit and rise. Roll it out into oval or circle. Cook over a hot skillet, covered with a lid for the first side. Brush garlic herb butter. Serve while hot. 3 tbsp aquafaba chickpea water, thick viscous water from a can of chickpeas, or from home made chickpeas , or use non dairy yogurt. Melt vegan butter in a bowl or warm the olive oil. Mince or crush the garlic and mix in. Mix in half of the chopped herbs. In a bowl, whisk all the dry ingredients until well combined. Mix in the herbs. In a small bowl mix the non dairy milk and lemon juice. Add to the dry. Add aquafaba, oil and sugar to the dry. Mix well and knead for a minute. The dough will seem dry then start to get sticky as you keep kneading. Add a tsp or more flour if too sticky or a tsp non dairy milk if too dry. You want the dough to be somewhat sticky. Cover the bowl and let it sit for 5 minutes. Spray oil on the dough and knead for a few seconds to smooth out. Divide dough into 3 parts. Roll each into a smooth ball. Flatten one, dust in flour and roll out into an oval or circle shape. Heat a skillet over medium high heat. When the skillet is evenly hot. Place the rolled out flatbread on it. Place a lid on the flatbread and cook for 2 minutes. Flip and cook for another 1 to 2 minutes. Place directly on the flame or grill to blacken, or continue to cook on the skillet until golden brown spots. Place on a serving plate and immediately brush with garlic herbed butter. Sprinkle some herbs. Repeat for all flatbreads. Store covered lightly in a kitchen towel over the counter for the day, or refrigerate for upto 4 days. 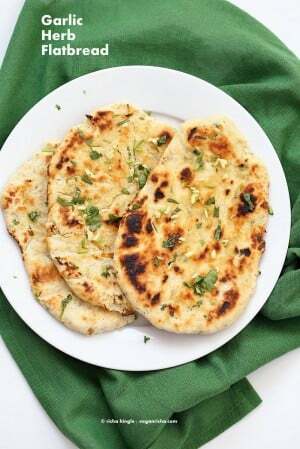 Alternatively: make these flatbreads like garlic Naans. At step3 , after rolling out the flatbread. Spray water on the flatbread. Sprinkle minced garlic and herbs on the flatbread and press in. You can also sprinkle some nigella seeds and press in. Place the flatbread with garlic side up on a hot skillet. Cover and cook as above. Once the flatbread is cooked, brush it with melted vegan butter or oil. Sprinkle more herbs/cilantro and store. Moby opens a vegan restaurant! Meet a former Pig farmer, who is now a vegan activist. Could the dough be made in a food processor? yes. double the recipe for a regular size food processor. I can’t get enough garlic bread. I am making this tonight along with your whole roasted cauliflower. Thanks! Any thoughts on gluten free? you can use a gluten-free flour blend that has gum, like Bob’s red mill gluten-free 1 on 1 baking flour. Add less flour to begin with and add more if needed to make a soft somewhat sticky dough. Thank you Richa! I don’t use gums but will thinker! my gluten-free Naan in my book doesn’t use gum. You can sub psyllium husk instead of gum. Let me know how it turns out. How should these be stored for the next day? Have you tried freezing them? I have tried keeping them in the refrigerator for upto 3 days. If you want to freeze them, cook both sides till just about getting golden and then freeze. Thaw slightly and Reheat on the skillet to brown spots. Let me know how they work out if you freeze them. I was just planning some recipes to make from your book and really wanted to make naan too, but don’t have any yogurt, but I do have aquafaba in the freezer, will be making this today! I just made your rosemary pumpkin flatbread and it was amazing, so I know what I’m trying tonight! Thanks Matilda. That is great that you are taking the challenge and want to continue on it. About Iron, no it is not true that vegans are anemic. Iron deficiency can happen to anyone not eating enough iron in their diet vegan or not. There are several sources of iron in the plant world like greens, beans, lentils, whole grains, nuts. http://www.vrg.org/nutrition/iron.php . Eat meals with enough helping of iron rich plant foods. Some people when they transition from a very meat heavy/ dairy heavy diet to eating only plant based ingredients, often do not know what to eat for a good filling meal and can end up eating either junk vegan food (processed options), or just salads, which is why they might develop deficiencies of iron or other vitamins. The key is to eat a balanced meal which has many ingredients of each category like greens(spinach, chard, kale etc), beans and lentils (chickpeas, black beans, kidney beans, other beans, lentils, peas, etc), some nuts and seeds (walnuts, almonds, cashews, sesame seeds, sunflower seeds etc), grains like oats, iron rich veggies as broccoli and bok choy etc. Thank you so much . Will do more research on ! I made this tonight, using white whole wheat flour and leaving out the salt. Very good and so easy to make. I am now going to look up your other flatbread recipes, since this was so good. Having Indian food on my birthday, hahaha! This looks absolutely amazing! 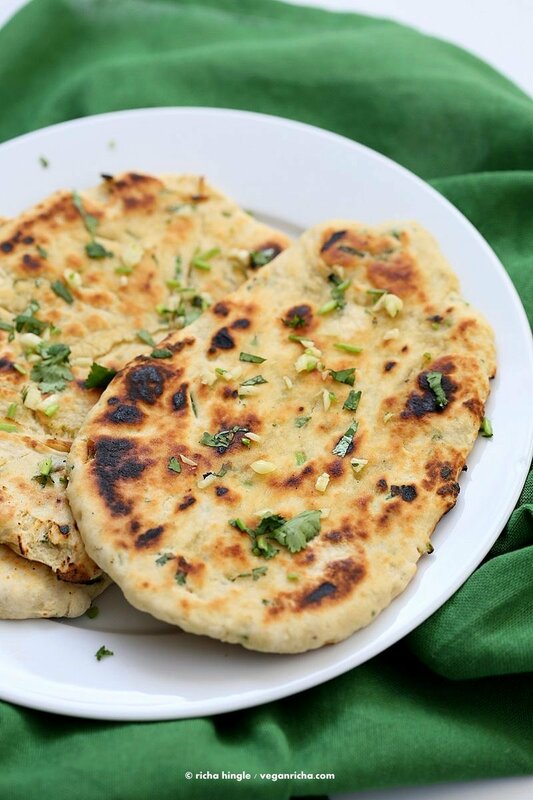 Can you make the SPICY TOFU PEAS STUFFED NAAN CALZONES with this yeast-free naan? yes you can use these. Double the batch and roll them out into a circle, fold to make calzones as in the other post. If I wanted to use the Flatbread as a pizza base, should I cook the dough first or cook it in the oven with the pizza toppings? It should cook ok to bake with the pizza toppings. Wow!! I wanted something special with dinner and looked to your flatbread, they were amazing!!! The smell, the texture, the taste! The instructions are perfectly clear, I even made a gluten free variety and was so happy with how easy and beautifully the dough rolled out. 5 stars!! ✨ My iPad would only select 4 stars but it is 5 or easily 10!! These were wonderful and so easy! Today was my first try ever at making skillet flatbreads—first your Rosemary Pumpkin Flatbread and then this Garlic Herb Flatbread, and they both came together perfectly, and the requests for more have already begun! I’ve learned to cook largely from your blog and cookbook. I so reliably enjoy your recipes that I usually double the batch even the first time I make it. Thank you as always! Amazing. Thank you so much!! I will be trying your other recipes!! Thank you for your great recipe ! Hi Richa, can you please tell me the role of aquafaba in it? What does it do in the recipe? Thanks. PS-Love all your recipes !! So does the chickpea water need to be whisked before adding to the rest of the recipe? Or can it be used as is? Yes, use non dairy yogurt. I just made this and it is sooo good! It’s super easy to make, and absolutely delicious. I made one batch, then after realizing how little it made, put together another batch. So glad I did because my family ate it all up!